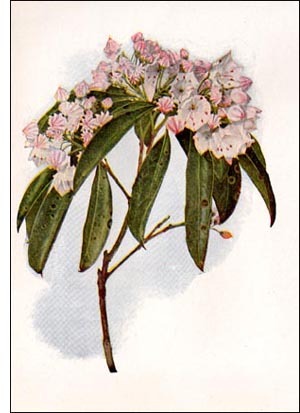 The genus Kalmia includes six known species, five of which are natives of eastern North America and one a native of Cuba. They are all beautiful shrubs, varying in height from a few inches to several feet. The plant of our illustration is a native of the western portion of the United States, where it grows in sandy or rocky woods and is more abundant in mountainous regions. This shrub, which grows to a maximum height of twenty feet, is a superb object early in June, when it is covered with corymbs of rather large pink or pinkish-white flowers and numerous evergreen leaves. Easily cultivated and highly ornamental, it has been introduced into the greenhouses and gardens of this and European countries. In spite of the beauty of this plant, it has a bad reputation, for its leaves are narcotic and poisonous to some animals. " Even the intelligent grouse, hard pressed with hunger when deep snow covers much of their chosen food, are sometimes found dead and their crops distended by these leaves."